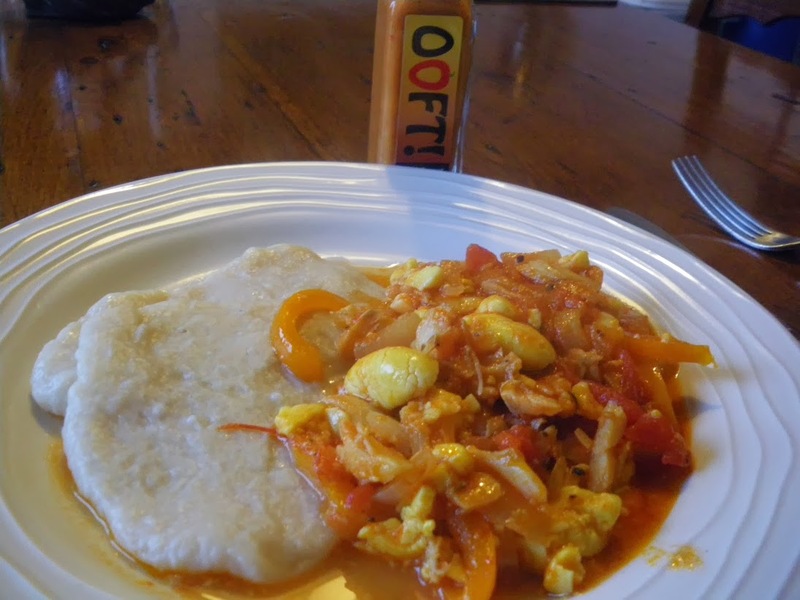 The Jamaicans have created a lovely tasty breakfast with this dish. Ackee is a fruit from a large tree and is poisonous if eaten unripe. So its best to buy tinned ackee available from most supermarkets that carry international foods. They are expensive around £4.50 a tin but the consistency and taste cannot be duplicated. In Trinidad there are a few ackee trees but most Trinidadians don't understand them and rarely eat the fruit. Boil about 1/2 lb of saltfish and drain. In a frying pan slow cook an onion sliced, a sweet pepper sliced and a hot pepper chopped until the go translucent and soft (about 5-10 minutes slow). Add a tin of tomatoes and some fresh thyme and maybe a little water. I also add a teaspoon of sun dried tomato paste and a tsp of sugar. Let this mixture cook slowly until reduced and tasty, add black pepper. then add the shredded saltfish and let this cook into the mix for 5 minutes before topping off with the ackee. Once the ackee is added don't stir much as it breaks up. To make the dumpling take 8oz plain flour (I use bread flour) and add a tspn of salt and a tspn of baking powder (no more or they will be soggy). Then mix with water to a soft consistency and knead for about 2 minutes. Boil; a saucepan of salted water and divide the dough into 8 pieces. Flatten with the hand or a rolling pin into saucer shapes and drop into the boiling water and cook for 15 minutes. Serve with Ooft hot pepper of course! This Jamaica ackee and saltfish with dumplings recipe looks really delicious. I've never tried dumplings like the one in the picture. I like that this recipe calls for ackee fruit to pair with saltfish. That seems like a good way to pair a fruity flavor with fish.